The Japanese-style painter YUKI Somei (1875–1957) is known as a figure who contributed to a revolution in modern Japanese-style painting. He did this by developing a style based on naturalism in the middle of the Meiji Period and by participating in the forming of Kinreisha (an organization encouraging Japanese-style painters) with painters such as HIRAFUKU Hyakusui and KABURAKI Kiyokata during the Taisho period. Many of YUKI’s written works about art survive today. Some of these works contain empirical information based on documentary research that is valued even today. These works include A Study of the Graves of Tokyo Artists (1931), A Description of the Graves of Tokyo Artists (1936), and A Description of the Graves of Artists (1953). These 3 works compile information on the graves of artists (with a focus on “artists” in the traditional sense), and they are valuable sources that provide clues to the past. 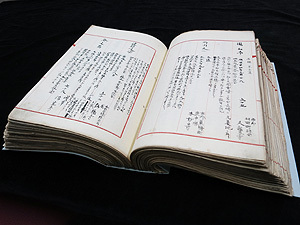 AOKI Shigeru, the head of the Association for the Study of Modern Japanese Art History and a visiting research at the Institute, donated YUKI’s rough draft of his series of descriptions of graves to the Institute. Like the printed edition, the rough draft features the date when different artists died, their age at death, and a biography. 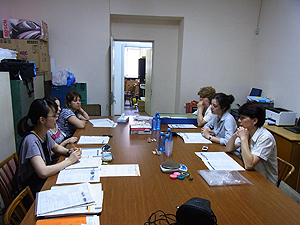 However, YUKI continued to revise the draft copy by adding information even after the printed edition came out. The assembled rough draft is more than 10 inches thick. The work conjures up YUKI’s devotion to compiling descriptions of graves. This work can be viewed in the Institute’s Library. 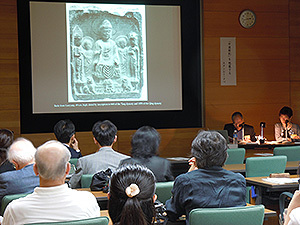 As part of the second Research Exchange between Japan and South Korea in relation to the Safeguarding and Preservation of Intangible Cultural Heritage that took place last year, Migiwa IMAISHI of the Department of Intangible Cultural Heritage visited South Korea for a scheduled 2 weeks starting on June 12. 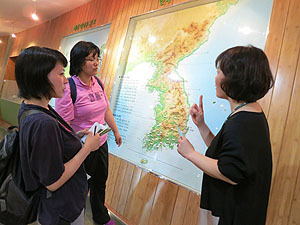 In South Korea, the survey examined traditional Korean techniques and their preservation and conservation. The survey focused on techniques of bamboo work in the Damyang region of South Jeolla Province and techniques of sedge (“wangol”) handicrafts on Ganghwa Island, part of the City of Incheon. Damyang is a major center for production of bamboo products, with almost all of its residents engaged in bamboo work. Five specialties, including the making of chaesang (bamboo boxes or baskets), the making of folding fans, and comb-making, have been designated as intangible cultural properties by the national or municipal government. 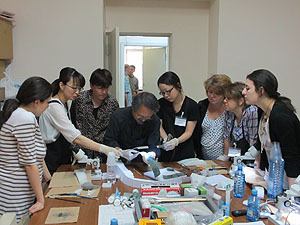 The survey provided the opportunity to meet possessors (preservers) of cultural properties and ask about traditional techniques, changes in those techniques, and the current state of preservation of those techniques. The survey also helped to ascertain circumstances regarding cultural properties in the form of efforts by Damyang County to turn its “bamboo culture” into a tourist attraction and revitalize the local area (e.g. development of new bamboo products, the County’s own craftsmen support system, and management of bamboo-related facilities). The survey provided a glimpse into how cultural properties have been passed on in the past and how they may be passed on in the future. Preservation of traditional techniques differs in Japan and South Korea. In Japan, traditional techniques are preserved under two different systems: “intangible folk cultural properties” (folk techniques) and “intangible cultural properties” (craft techniques). In contrast, traditional techniques in South Korea are preserved under only one system: “intangible cultural properties” (craft techniques). Thus, techniques that fall under “intangible folk cultural properties,” i.e. techniques that are “indispensable to understanding changes in the Japanese people’s way of life” in Japan, are considered to be “intangible cultural properties” in South Korea, where they are valued as arts, skills, or techniques with “significant historical, artistic, or scholarly value.” These differences in the Japanese and Korean systems must have an impact on the perceptions of preservers of cultural properties and the general public and they might also impact techniques themselves. These varied impacts must be clearly discerned during future research exchanges. From May 24 (Fri.) to June 4 (Tues.), the Modern Cultural Properties Section conducted a field survey of 7 world heritage sites and potential world heritage sites associated with modern cultural properties in Germany and Poland. The survey also examined the conservation and restoration of railroad and industrial heritage. In Germany, the survey examined the Berlin Modernism Housing Estates (which have been inscribed as a world heritage site), the Dresden Elbe Valley (which had its status as a world heritage site revoked), Electropolis Berlin (Berlin as a locus for the heavy electrical equipment industry) and mining and the cultural landscape in Freiberg in the Ore Mountains (both Electropolis Berlin and the Ore Mountains are nominated as world heritage sites). 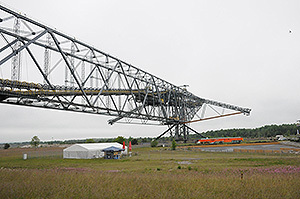 In addition, the survey examined a massive F60 overburden conveyor bridge (a machine used to strip-mine coal that is over 500 m long), paddle steamers that travel the Elbe River, and preserved railroads that operate steam locomotives. The sites and machinery have their own unique characteristics, and they have been conserved via ingenious techniques. The Berlin housing estates appear unremarkable, but the survey revealed that residents and managers have united to save these buildings, which are cultural properties. In Poland, the survey examined the historic center of Krakow (“Old Town”) and Auschwitz concentration camp (Auschwitz-Birkenau State Museum in Oświęcim), both of which are world heritage sites. There was debate over whether to preserve Auschwitz as a museum because of its historical significance, but the site now has numerous visitors. 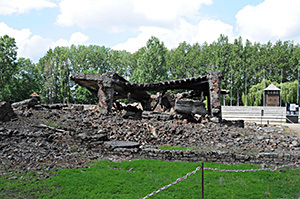 Open to the public, the gas chambers and crematoria that the German Army blew up as they retreated have been preserved as they were. However, the buildings were red brick and mortar, so conservation techniques are an issue. The Hiroshima Peace Memorial (commonly called the “Atomic Bomb Dome”) is in a similar. 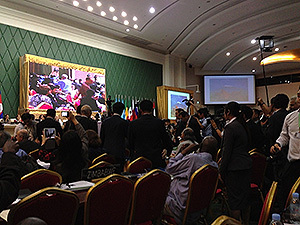 Sharing information on conservation techniques should prove beneficial.